Cup cakes are so quick to make, they are a great fall back if you suddenly discover you are short of a sweet treat at tea time. Kids love them because they are so easy to eat and they make great additions to pack lunches and picnics. 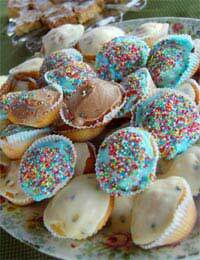 There are all sorts of sugar free recipes for anyone who wants to make cup cakes. Most are ideal for both adults and children to follow. These versions use sugar free jam, honey and granulated sweetener instead of sugar. Try this new take on the chocolate cup cake. By using the zest and juice of two oranges you can add to both the flavour and the sweetness. Preheat your oven to 180 deg C/350 deg F/gas mark four. Melt your margarine, honey and cocoa in a small pan over a low heat. Carefully grate the zest of your two oranges and squeeze the juice. Stir the juice and zest in with the saucepan ingredients. Then sieve your flour into a large bowl. Stir in the hot liquid. Beat your eggs and stir those in too. When thoroughly mixed, spoon the mixture into paper cake cases placed on a baking sheet. Bake for approximately 10 minutes until risen. Dust lightly with cocoa powder to finish off. These cup cakes have a fruity apricot taste. Sugar free apricot jam adds both sweetness and extra flavour. The cream cheese topping works beautifully with the apricot in the cup cake and topping. Preheat your oven to 180 deg C/350 deg F/gas mark four. Beat your margarine and apricot jam in a bowl until light and fluffy. Then beat your eggs in a separate bowl, and mix in. Sieve your flour and add to the cup cake mixture. Spoon into small paper cake cases placed on a baking sheet. Bake for approximately 10 minutes until risen. Allow to cool. Then beat your cream cheese in a small bowl with your apricot jam. Mix well and spread on to the top of each cake. Finally, top with apricot slices. These apparently plain cup cakes are extremely tasty. Quick and easy to make, they can be rustled up in just a few minutes. Preheat your oven to 180 deg C/350 deg F/gas mark four. Beat your margarine and granulated sweetener in a bowl until light and fluffy. Beat your eggs separately then add to the margarine. Add your vanilla essence. Sieve your flour into a large bowl. Stir well. Spoon the mixture into paper cake cases placed on a baking sheet. Bake for approximately 10 minutes until risen.